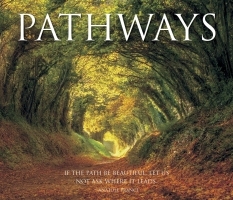 Pathways will entrance your imagination to a relaxing and stress free get away helping refresh and renew your inner spirit. You will enjoy all the beautiful scenery along bridges, sidewalks, gardens and forests paired with inspirational quotes. Your thoughts will take a journey to an enchanting retreat as each inspirational quote inspires creativity. Pathways is an incredible resource for reflection on life's journey and would make the perfect gift for a friend or loved one. Stunning images of nature's paths will take you to a place of reflection.